Looking for a different kind of vampire story? Then Kaptain Vamp by Joanne Lecuyer might be just the thing. Allistaire Arturius Doppelganger Varning IV is not your typical vampire. His parents, mom is a doctor and dad is a scientist, created him and his brother and sister by crossing vampire genes with human genes. So, while he has many of the traits and abilities of a vampire, he can go out during the day and isn’t required to sleep in a coffin. Allistaire learned from his mother that not long ago, humans were afraid and distrustful of vampires, so he wants to change all that. With the help of his best friend Rich, a human, he is inspired by a comic book superhero to become Kaptain Vamp and perform good deeds. I’m not a huge fan of the paranormal genre for kids. I feel it’s been over done to the hilt. When I was asked to host this author by Promotion a la Carte, however, I thought this book sounded different from the usual vamp story, so I agreed to review it too. 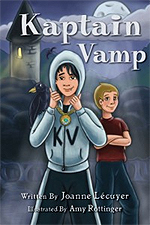 Kaptain Vamp is definitely not your typical vamp story. We have this young, funny, upbeat vampire who wants to change the humans’ opinions on vampires by performing good deeds. He’s just not sure how to do it. When he finally figures it out, he enlists the help of his human best friend, Rich, to create an alter ego so he can perform these good deeds. Inspired by a comic book superhero, the boys create Kaptain Vamp, costume and all. Young readers will definitely laugh as they read this book. Lecuyer does a great job of creating characters that readers can relate to well. It’s a light easy read that will leave them eager for another Kaptain Vamp book. The artwork provided by Amy Rottinger is out of this world. From the cover to every interior illustration, she captures the essence of this book and its characters perfectly. The one thing I found confusing is how the book started off, versus how the rest of the story was told. Chapter 1 is a letter from Allistaire to the reader, revealing much of his past and how his family came to live where they do. It talks all about his vampire powers and his human traits. The reader is immediately drawn in by this witty, charming vampire on a mission. But starting in Chapter 2 and for the rest of the story, the point of view is third person omniscient. I was disappointed. I really wanted Allistaire to tell the whole story, since I loved his character right away. In addition, some of what Allistaire reveals in his letter, is then told throughout the balance of the story, so it’s redundant. I don’t feel a younger audience would mind, but I couldn’t stop thinking that I really wanted to hear Allistaire tell this story from beginning to end. I would love to read a Kaptain Vamp sequel. I hope that’s in the author’s plans. I received a FREE e-copy of this book from the author in exchange for my honest opinions. I did not receive monetary compensation of any kind to provide this review.